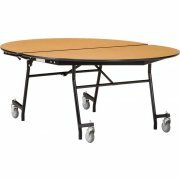 Oval cafeteria tables from NPS have all of the features you need in a busy lunchroom. A torsion bar system enables one person to easily set up or fold up the table. With automatic locking in the open and closed positions you can be sure that these lunchroom tables are staying put. They also lock in the partially-folded position, making it easier to clean underneath. These cafeteria tables have a safe, sturdy design that will serve your school for many years. A 16-gauge steel frame, tamper-free hardware and power-washable phenolic backer ensure long-term stability and strength. 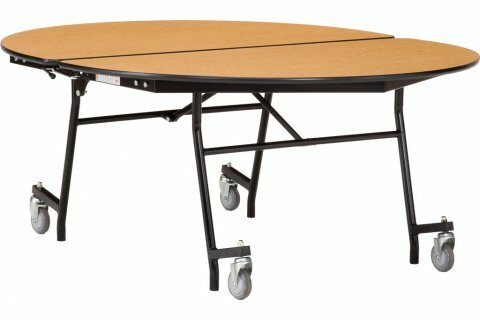 Heavy-duty wheels lift up automatically when the table is in the open position to prevent unwanted drifting.